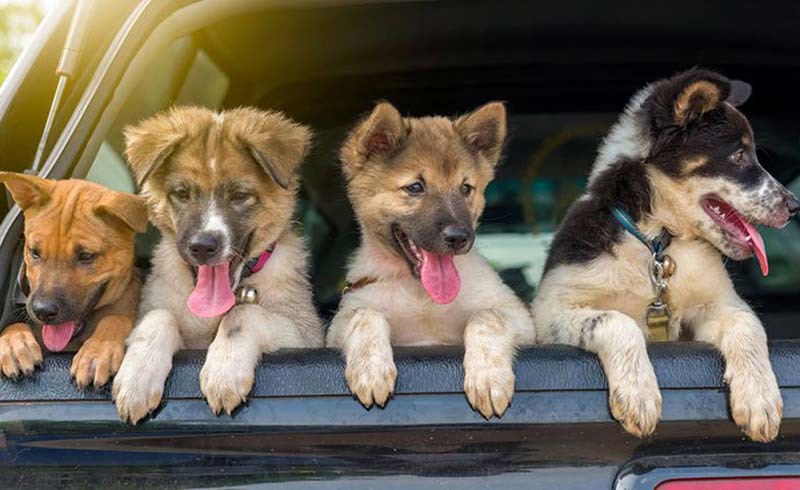 We love traveling with pets, but long rides can get thorny. Here are tips to keep pets comfy, safe, well-fed and happy. Summer is a great time to enjoy the outdoors, the best food of the year and, of course, vacations! We love taking road trips this time of year. There’s no weather to worry about, and you can dawdle in small towns or have amazing picnic lunches at scenic overlooks. 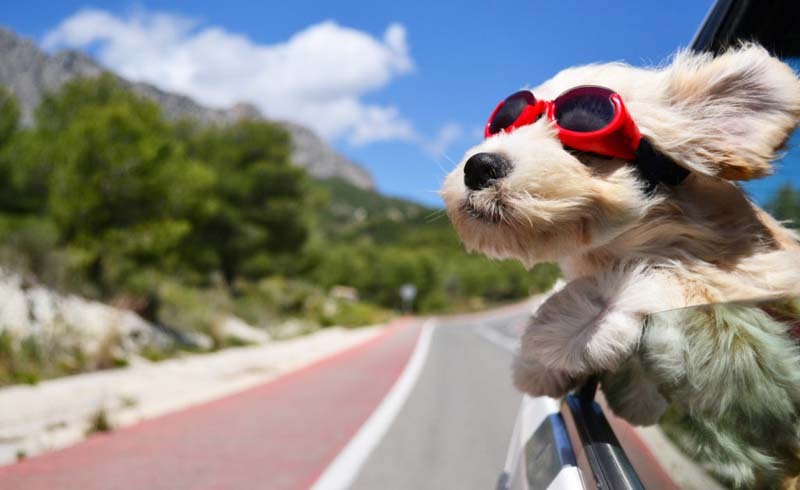 For pet owners, road trips are an awesome way to travel, cheaper and less stressful than air travel. But while some dogs love to hang their heads out the car window and relish the breeze, others loathe car rides. And just about any car passenger, two-legged or four, will get antsy after two or more solid hours of sitting still. First things first. Make sure your pet is safely secured in your car, whether with a pet seat belt, harness, booster seat or car seat. Just like people, dogs need the equivalent of a seat belt to prevent any injuries. Do not have them roaming around, as it leaves them vulnerable to falling or getting hurt if you have to stop or turn suddenly. Seat covers ensure that pet snacks don’t end up on your car seats. There are many different types of seat covers out there from which to choose. They keep your pet cozy and your car seats clean. Muddy or wet paws can easily stain car seat fabrics, so prevention is key. Once you are back home, just remove the seat covers, throw them in the wash and ta-da, good as new. Since your pup will be sitting or lying down for a few hours at a time, make sure its seat is very comfy. Pillows, blankets and dog beds can all be used to help pets enjoy their ride. They may want to take a little nap, so their favorite plush toy will do the trick. Snug as bug (or pup) in a rug. We all like to eat some tasty snacks on the road, regardless of species. (We’ve got some snacks both humans and dogs can enjoy!) If you’ll be gone a full day, make sure to bring enough kibble along, and offer food at roughly the same time that your pet usually eats. Altering its schedule can cause tummy upset-definitely not something you want to risk on the road! Be sure to bring a container of cool drinking water, too. Easy to forget, but pets get parched, especially in a dry, air-conditioned space (or a hot car). Alleviate travel anxiety by bringing along some objects. A favorite toy, a piece of bedding or even an owner’s undershirt or other scented item will bring the smell of home along. Keep your pooch entertained and busy to make the time fly by. Toys such as Kongs, puzzles, the Tricky Treat Ball, the Waggle or the Dog Casino stimulate your little friend’s mind and keep it happy. We especially like chew toys, because they’re solitary and absorbing. Toys also come in handy in the hotel room, campsite or rental. Taking rest stops for potty breaks is essential. This is a great time to get your pet moving so it can stretch out, exercise, boost its appetite and maybe even take a snooze for the next portion of the trip. Rest stops help pets keep some semblance of a routine, and human passengers will also get a chance to get their blood flowing. You will be busy having fun and enjoying your vacation, but don’t forget to take pictures! Document your road trip and save your sweet moments together. Be sure to keep your pet’s Instagram totally up to date. Traveling with dogs and cats is so much fun, but does require some planning and preparation. So pack your bags, make some yummy snacks and go forth and road trip with your pet! Dogspeed!